Hollis Palmer thought that, after stopping the aliens from blowing up Austin and rescuing Mia, he would be free to live his life in peace – at least as much peace as could be expected from a world overrun with aliens. But the aliens have other plans. All around him, Hollis is finding people whose brains have been zapped by the invaders, and now they are little more than zombies. And the whole thing seems to be centered on the nearly ubiquitous Astral app that had first predicted their arrival. Now, Hollis and Mia must face their final – and hardest – task yet: They will have to save not just each other or their home city, but the entire world. 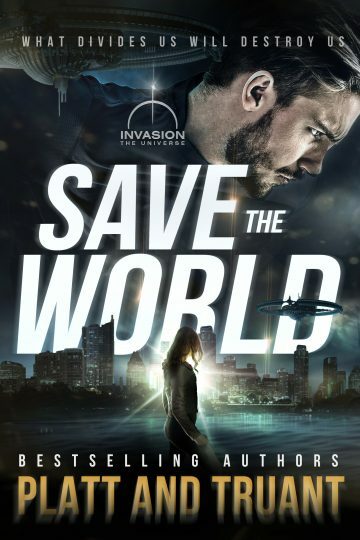 Save the World is the epic conclusion to Sean Platt and Johnny B. Truant’s new series set in their bestselling Invasion Universe. If you’ve enjoyed the exploits of Hollis and Mia, you’ll love this thrilling final chapter! Pick up your copy today!